John grew up on Long Island and ever since being a kid was involved in nature and ecology. Scene of the farmyard from the house shows some of the couople’s potted pollinator plants, hoop houses, and fruit trees. “My earliest memories,” he recalls, “are me out in the back yard on my knees looking at ants – just being fascinated by them. After college I joined the Peace Corps and went to Mali. They put me in agriculture because I’d studied entomology. That’s when I fell in love with agriculture. Nancy joined the Peace Corps and went to Kenya, so they had a long distance love relationship in Africa with letters and an occasional visit. Upon returning to the States they got married and John went to Michigan State Ag School, where he got a masters in entomology while Nancy got her PhD in Environmental Engineering. The couple bought a farmhouse on 18 open acres of what had been a large dairy farm. Having been hayed without much reinvestment ever since the dairy went out of business, it was all in reed canary grass and the soil was in pretty bad shape. The pair decided to start with livestock. They raised a thousand meat birds a year, had a 50 ewe flock of sheep and were raising heifers, rabbits, pigs, 200 laying hens, turkeys. Their manure and grazing was great for bringing fertility back to the land and knocked the reed canary grass into just the wet areas. The Haydens also raised 4 kids there, two ‘homemade’ boys and two adopted girls. “Then as our kids got older and fertility came back,” Hayden recalls, “we started planting vegetables. We had a 24 member CSA, opened a farm stand. But the vegetables were a lot of hard work and we were getting older. And everything with them was urgent! It took Nancy’s job to pay for the mortgage, get health care and raise the 4 kids. But now she has left her job and the farm is their entire income. They are growing more and more fruit and have started an extensive nursery. They like growing stuff, they say, and are just trying to keep the quality of life they like! John’s early fascination with insects has never left him, however. “We had this realization about 8 or 10 years ago,” he says, “that the pollinators were declining mostly the native bees. We’d go into a field in the seasons prior to that and we’d hear all this buzzing. But then it was just a buzz here and there. So we thought: ‘we should start being more proactive in planting crops and building habitat for pollinators’. So we have been doing that. “We don’t use chemicals,” he continues, “even organic ones. Entrust, from Dow, for instance, is highly toxic to pollinators. Just because it is organic doesn’t mean it won’t wreak havoc on your ecosystem. I think their decline is because of all the chemicals around us plus the others stresses on them. Fungicides are harmful to bees. The neonic pesticides are really bad for the environment, plus diseases and viruses and parasites like nosema. So first off, put away the pesticides. Solitary bees, Hayden explains, do not swarm, form colonies, produce honey, or have a queen. Each female lays eggs but does not tend them through growth. Most nest underground, but some nest in above ground structures like trees. They do not produce wax, instead constructing cells of mud or other materials. They feed on nectar for their energy, but collect pollen for protein needed by the brood, mixing it with a small bit of nectar and packing it into a cell before laying an egg in it. They do not have pollen baskets, as honeybees do, so lose more pollen than social bees. This, however, makes them excellent pollinators. A single red mason bee, for instance, is equal to over 100 honeybees in pollination services. 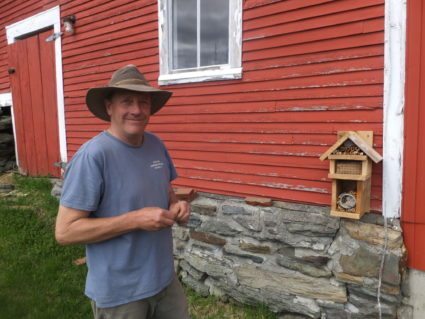 John has built a number of orchard, or Mason, bee houses. The bee is native to North America, with an Eastern sub-species and a Western sub-species. (There are mason bee varieties all around the world, though.) Mason Bee houses are essentially a protected group of tubes. The adults will emerge in the spring, collect pollen, make a ball of it in a tube like a large drinking straw, and lay an egg in it. (In nature, of course, they might use hollow stems of plants instead of straws.) Then they will seal the opening with mud and make another one. They do this down through the whole straw so there are six or seven eggs in the straw. Each bee will fill several straws. The eggs develop in their cocoon and spend most of the summer as larvae. In the fall they pupate, undergo metamorphosis, and in the spring come out of their tubes. The adults only live 4 to 6 weeks. The bees determine whether an egg will be a male or female the fertilized ones are the females and the unfertilized ones are male. Female eggs are laid farthest back in the tube, with the drones toward the front. The ratio is about 50/50 male and female. The drones emerge first and wait around to fertilize the females. Their nest has to be within 100 yards or so from the plants you want them to pollinate, but they are much better pollinators than honeybees. They fly in cooler weather, are out earlier for things like cherries and plums, and visit more flowers – something like 12 times more flowers. Nobody has researched if these bees communicate as to where a good pollen source is, although John suspects they do. The USDA is helping him put out the orchard bee nest boxes on different orchards and farms around the state. They are trying to find out what native bee populations are around. 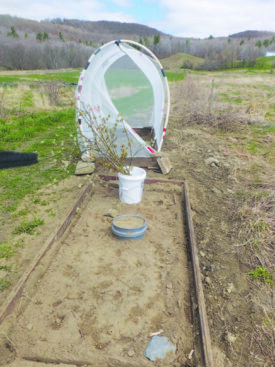 Ground bee trial shows tent which can be placed over the constructed bee nest (holes in ground in metal collar), flowering branches which are placed in water for bee fodder, and sandy bed for bee nests. Hayden is also doing research on ground nesting bees. They have the same kind of solitary bee life cycle as the mason bees do – feeding on a little nectar for them but pollen for the brood but lay their eggs in holes in the ground. They like a sloping south-facing sandy soil and will make little tunnels coming off of these holes, laying an egg in each one. John is testing three variants of ground nests for them. The first is simply holes in the ground, the second involves a little tent over the holes in which he keeps the bees in for a day, and in the third he keeps the bees for three days. “These are called cellophane or plaster bees,” he explains. “That is because they line their nests with a clear cellophany material. It makes them waterproof and maybe keeps ants out. The genus is ‘colletes’. They are good at all the early season fruit. In the tents I have some early blossoms here in water, for food for them. “I made these holes,” he continues, “and I’m seeing what the bees are doing. I put the bucket here to protect them from ants. Our soil here is more silty than sandy, so I dug this areas out for a couple of feet and brought in sand. The others use our soil. That is one of the things we are finding out, how well can you create sandy soils for this purpose. I’m excited to see there is some fresh digging besides my holes. I caught individual adults and brought them here in a container and released them for each trial. Social bees like honey bees and bumble bees of course work together. There are many types and they have various behaviors, but generally there is one queen who is tended and produces eggs for the colony, with workers and drones serving her needs. Honeybees are the primary example of social bees. They are good pollinators for some things John feels – cucubits and, on a nice day, apples. But for blueberries, forget it! Their tongues aren’t long enough to get in the flower well. If there is not much else around they will force themselves to do it. But native bees do most of the work on blueberries. The Hayden’s farm sign is about the only advertising they need. The nurserey business is growing by 50% per year. Bumble bee queens are mated at the end of the season. They overwinter in the ground or in hollow, rotting barns or trees and emerge in the spring with a lot of work to do to find a suitable nest site, collect pollen, lay eggs, brood those eggs by keeping them warm, all while foraging back and forth all by herself for 22 days until the first workers hath out. At the end of the season the colony sends out a bunch of virgin queens and drones. They mate and the queens will then find a place to overwinter – a compost pile or whatever. One of the things that the Haydens pay special attention to is raising fodder for pollinators. Without continuous sources of pollen and nectar throughout the season, of ocurse, bees can easily starve. “This is our pollinator sanctuary — the whole farm is really one,” John gestures at various plants as we walk. “These go from the willow, which is very early, to Witch Hazel, which blooms in October or November. These are honeyberries. They are early bloomers. Cedar waxwings love them and we have to cover them. The fruit is a little tart, but makes a good flavor. We have been experimenting with sunflowers for cover crops. They are late and given that most everything is getting earlier because of climate change, sunflowers are a crucial crop for late pollinators. Jerusalem artichokes are late, and witch hazel is really late. photo by Jack Kittredge Dwarf organic apple trees growing in the hoop house. “We try to raise a lot of things that are good sources for native bees,” he continues. 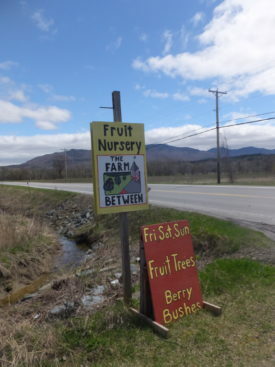 “We like edible landscaping, so we use a lot of fruits. We like the native fruits, and the bees love them. This is aronia. We love it. We blend it with apple cider – 20% aronia juice. They aren’t that sweet but blended with a sweet source they add a lot of flavor. These are native plums. They are very early. These are willows, among the first to flower. Here are box elders, an early flowering tree. We plant them and use them for wood chips for mulching. It’s a way to collect carbon while providing habitat to birds and pollinators. Every farm should have a wild, biodiverse area! We also have a lot of heirloom fruit we are putting in. We have a lot of trees and bushes planted black walnuts, black locusts, hawthorns, for wildlife and pollinators. Black locusts are great for pollinators and the flowers are edible. We make syrups from it. We love black locusts! 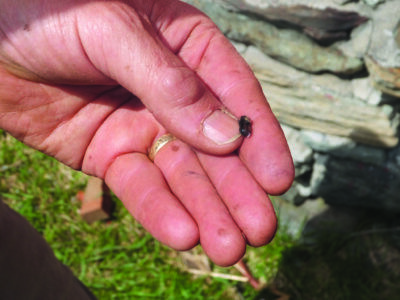 John holds a dead Mason bee that was killed before emerging from it’s cell. 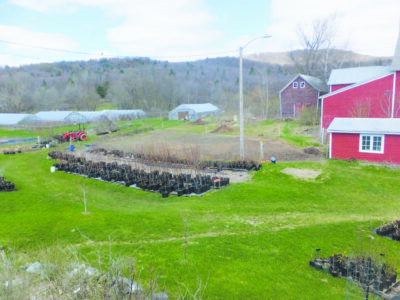 In order to have this wealth of pollinator plants, John and Nancy have developed a considerable nursery containing perennial seedling trees and bushes. They raise fruit trees, native bushes, and pollinator plants – for all of which there is a developing market. John grafts scion wood onto bought root stock. He likes doing a cleft graft if the sizes are quite different, and a whip and tongue if the root stock is small enough to be still flexible. The nursery has been going for three years now and it is up to about a third of the farm’s income. Of course much of the fruit grown on their trees and bushes ends up in products sold by The Farm Between. They are growing thirty different kinds of fruit and particularly like black currants, which grow well for them. 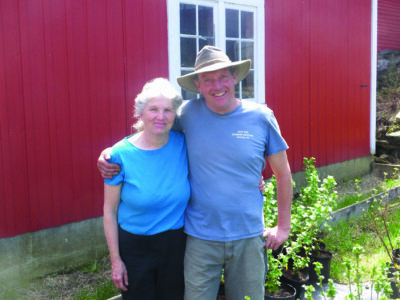 Nancy and John stand in front of some of their many black currant plants. They extract the black current juice using a steam process and make a delicious syrup from it ideal for pancakes. 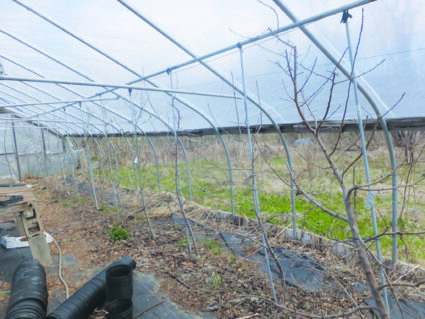 The couple is planning to turn four greenhouses over to tree fruit this year. They want to grow organic apples with no spray practices, so keeping the rain off them is priority number one, making sure they don’t get apple scab. So they are growing some dwarf apples in a hoop house. The insects haven’t found them yet even though they didn’t even screen the sides! Currently they are growing Honeycrisp, Empire, and IdaRed trees, from which they got huge perfect apples last year. Now they are going to expand into stone fruit, using drip irrigation. Given the amount of knowledge John and Nancy have about ecology, it is not surprising that they are devoting more and more of their time to educating others. They do on farm workshops about Farming on the Wild Side and Pollinator Advocacy already, and John is doing a two-day session with Michael Phillips this year.